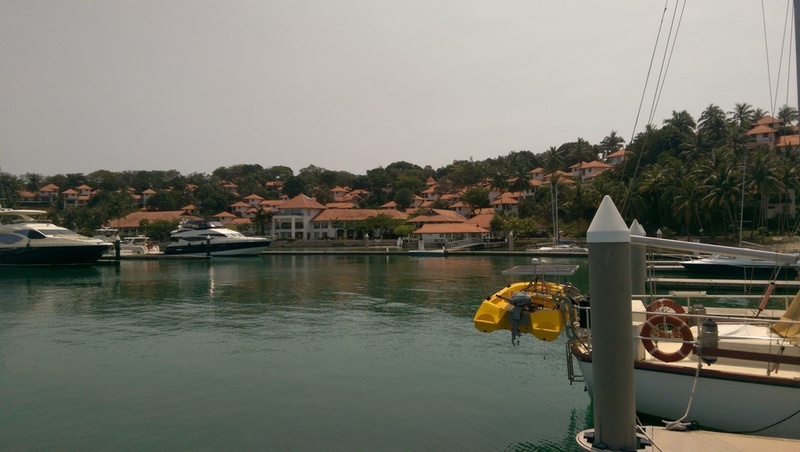 We have been comfortably berthed at Nongsa Point Marina for the past 5 nights. When we arrived the smoke and haze was in full force and it was delightful to connect to shore power and run the air conditioning. However, two nights later a big thunder storm came through and since then the wind has been from the northeast making the air a lot cleaner. It is still hot and humid; what else would one expect being 60 nautical miles north of the equator? This is a nice marine associated with a large resort. The staff is very friendly and helpful. Unfortunately, the are in the middle of renovating the swimming pool, so Susan has had to walk 15 minutes each day to use the pool at a sister resort. It is the off season, so there are few guests. We have had two delicious lunches in the resort restaurant; however, we still have a substantial amount of frozen meat from Australia, so Susan has been cooking delicious meals too. On Monday we shall cross the strait and checkin at the Republic of Singapore Yacht Club. Villa G will stay in Singapore two months and we shall fly back to Bali to look after the house construction there.